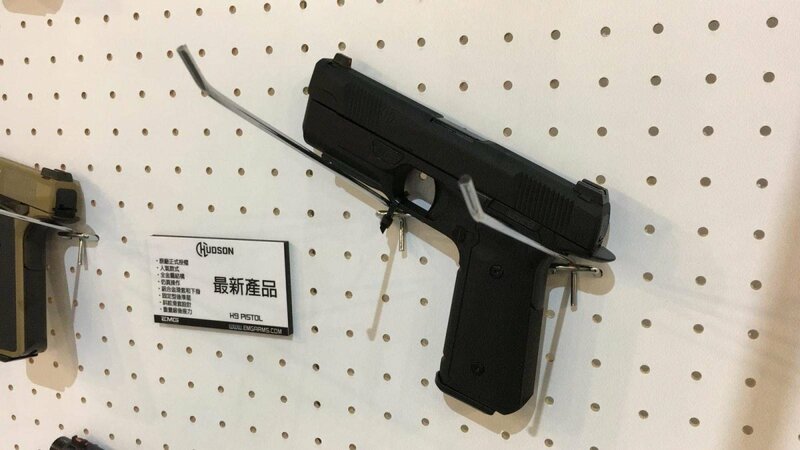 At the KYAirsoft Facebook page showing WE's display at the MOA show, Taiwan. First the Hi-Power and now this! This is pretty nice. Gonna have to make more room. Wonder of the will try to get them to work with "G" mags or a Hi-Cappa style. Got to hand it to WE. They do this and everyone else plays catch up. Very cool. Haven't heard a lot of great stuff about the real thing, but it's got personality for sure. 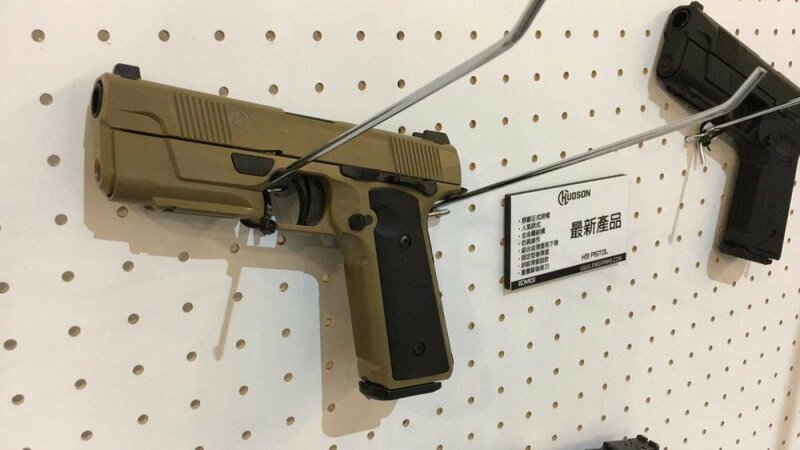 Evike has also shown an 'EMG' Hudson h9. I wonder if it's the same WE OEM, or if there's another company out there making one as well. It does have EMG on the description cards so I'm guessing it's the same. I've just realized these are going to look super awkward with a weapon light on the rail. Gonna be like a Mk23 LAM and if you get the more high tech looking lights it I imagine it would lend well to its sci-fi looks. Indeed. It's going to need something to compliment the lines. Just sticking an X300 or the like on iti isgoing to look weird. Wonder if this will work in the Omnivore Holster with either the TLR-1 or Streamlinght? At least that holster is available now. Coming soon in the next season of The Expanse. 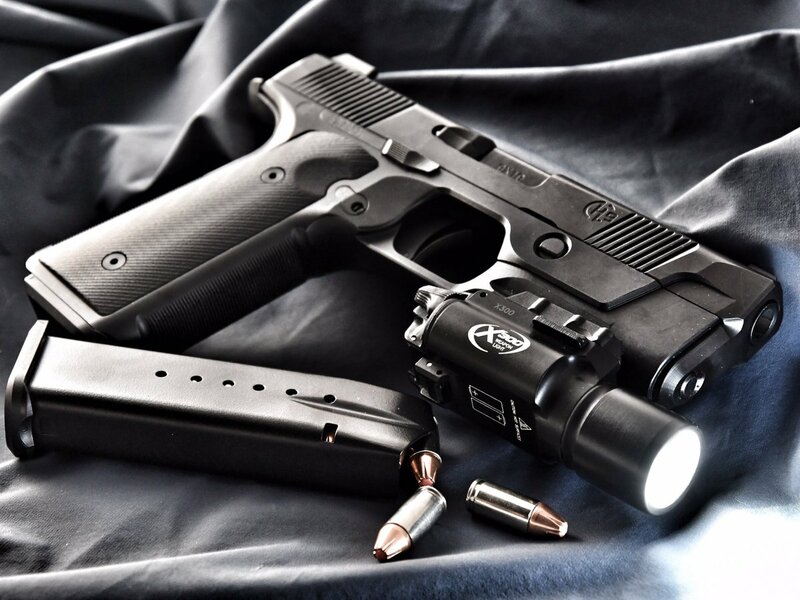 Evike just announced "May 2019" delivery (we shall see)..$180.00 (US). With Hudson filing for bankruptcy, I'm wondering if WE is still pushing for this? To bad. Went the way of the Bren Ten. Was kind of looking forward to this...as I was the Bren Ten. I don't see why WE would abandon it. They've already invested in molds, licensing etc. Plus, it will have the rarity factor that people won't be able to buy the RS but can buy the airsoft version if they like it. To me it's like a plane that never flew. Unlike other guns which are long out of production, their historical use and involvement in films/video games would boost their popularity. Well Evike is still taking pre orders for an ETA May release. Maybe a limited run and then done? Would love a Bren 10. Maybe they can knock a few $ off that ridiculous $180 price tag. Hudson would continue to own the IP and Trademarks which are still protected, bankruptcy doesn't mean it's open season to rip them off, it doesn't even necessarily mean they will discontinue operations. The IP and TM will be looked at as assets, however negligible, that creditors can use to make themselves whole or that Hudson will retain in an attempt to restructure.